Like many of you reading this editorial, I was initially excited by the announcement that The Boondocks was coming back for a fourth season. I was an avid reader of Aaron McGruder's witty, satirical, political and provocative cartoon from the 1990's until it ceased publication. Dating back to before it was even syndicated to newspapers nationally I'd go to Okayplayer to get my fix. McGruder figuratively and literally draws inspiration from the same extremes that make up the diaspora of hip-hop music and culture: Huey Freeman reflecting the political views of The Coup and Immortal Technique, while younger brother Riley has the thugged out tendencies of Jeezy and N.O.R.E. The fun of course is that the cartoon strip reveals that the Freemans are not nearly this one-dimensional. Huey is more of a struggling young adult trying to find his way in the world than the political anarchist he believes himself to be, and Riley tries hard to hide that deep down he's sensitive and emotional - judging others on a scale of manhood he winds up falling short of if applied as rigorously to him. The interactions with their Granddad and the suburban neighborhood they moved to is the premise that both defines the strip and creates the comedy that fueled its popularity and led to the television show for [adult swim] based on said same. None of this works without the driving creative force of McGruder behind it. There is often a very thin line between McGruder's own views and those of his creations, and when he stepped over it to criticize BET or whatever POTUS was in office at the time, strips didn't make it to syndication and episodes of the show wound up not airing. Far from hurting the popularity of The Boondocks, the censorship of controversial content helps fuel its cult status, and established McGruder as a pundit unafraid to piss off both the political left and right in equal measure. "What has never been lost on me is the enormous responsibility that came with The Boondocks - particularly the television show and it's relatively young audience. It was important to offend, but equally important to offend for the right reasons. For three seasons I personally navigated this show through the minefields of controversy. It was not perfect. And it definitely was not quick. But it was always done with a keen sense of duty, history, culture, and love. Anything less would have been simply unacceptable. As for me, I'm finally putting a life of controversy and troublemaking behind me with my upcoming Adult Swim show, BLACK JESUS." It seems that Aaron McGruder and Time Warner (the parent of Turner Broadcasting, in turn the parent of Cartoon Network, subsequently the broadcaster of [adult swim] on CN) have not completely parted ways if BLACK JESUS comes to fruition. 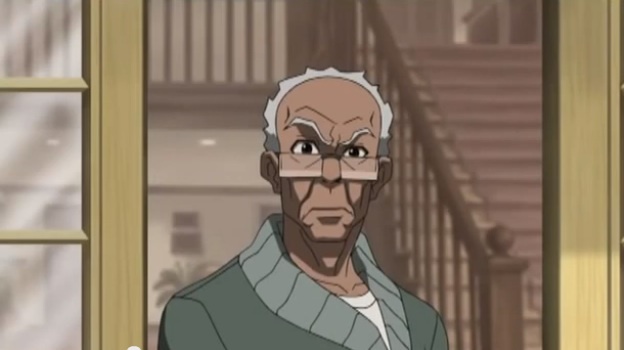 The legitimacy of a fourth season of The Boondocks without Aaron McGruder as the creative force behind it though deserves more scrutiny than it has thus far received. 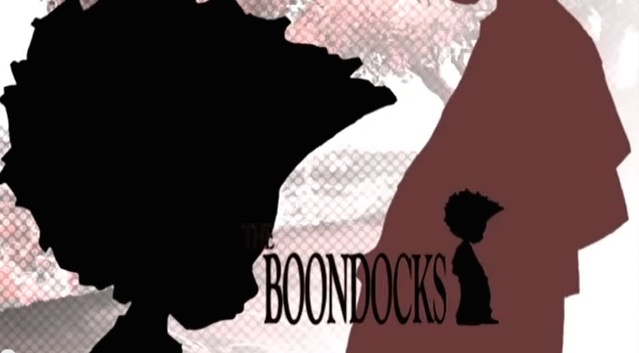 I'd be in favor of not even calling it The Boondocks any more - at least the version of it that we see on TV. "The Adventures of Huey, Riley and Granddad" might be more fitting. What's deceptive to the TV viewer is that it doesn't seem to have really changed at all - the characters are still drawn the same way and the voice actors (Regina King and John Witherspoon) are the same. Other than people reading this editorial many viewers may never realize this is no longer Aaron McGruder's show. Should you still watch and enjoy The Boondocks for its fourth (and perhaps mercifully) final season? That's not for me to say. I'd argue that you should buy books like "A Right to Be Hostile: The Boondocks Treasury ," but I'm willing to suspect McGruder doesn't get his fair share of royalties from print compilations of his work either. Perhaps in the end he does benefit from season four though. Even if he's not writing it or creating it he still has to be paid a license FOR it - I hope. As I learned 15 or more years ago when I had a conversation with him, promises of payment from the purveyors of your product are only as reliable as the paper they're printed on. He was wiser than me back then and undoubtedly still is today. I can only hope that whatever the situation is that led to The Boondocks continuing on TV without him, he's comfortable with them taking his vision in a new direction - and I won't be surprised if he ends up lampooning it somewhere.